With the summer in full steam, White Parties are popping up all over the Island. The tradition of wearing white between Memorial Day, the unofficial start of the summer, and Labor Day, the unofficial end, is in full force. The trendy parties are chic, with men dressed in the stylish, trendy all-white looks incorporating white linen button-front shirts and breezy pants with a pair of white sneakers or boat shoes completing the look. Women can play up whimsy with dreamy white dresses or sleek off-the-shoulder tops and white pants. What is great about these parties is that the minimal, monochromatic outfit is always a winning look and everyone can pull it off. 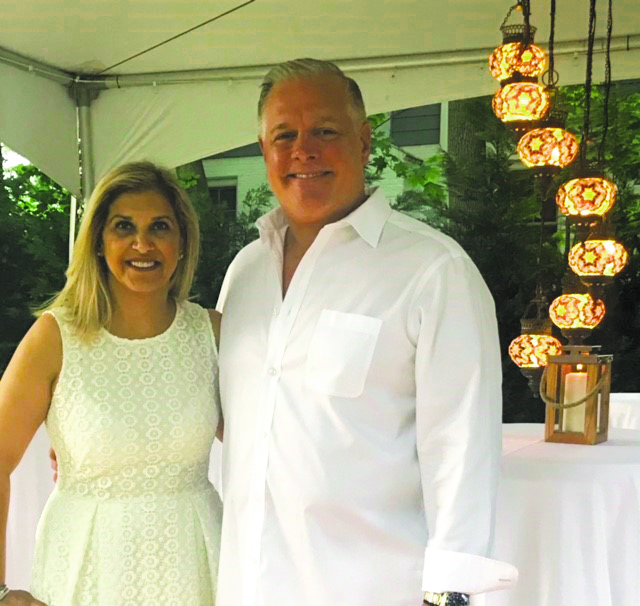 The Tantillo White Party went one step further and included local cuisine from numerous Manhasset’s eateries on Plandome Road support Manhasset’s Chamber businesses. The Tantillos are self-employed and own local businesses; Jen is the owner of Parsons Floors and Jeff owns The Chef’s Warehouse. The stylish party bonded friends and provided what Manhasset eateries have to offer.